Are your living spaces in need of order? 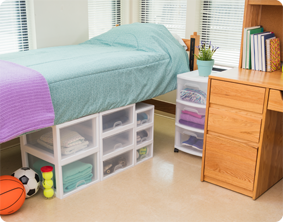 Mix and match the three sizes of Stacking Drawers to create a customized storage system and give everything a place to be stored! 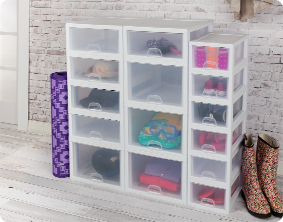 The 16 Quart Stacking Closet Drawer helps to organize closets and living areas simply. 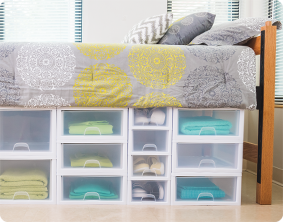 Drawers neatly stack on top of each other creating storage towers and offering flexibility in expanding as needed. Organize, sort and store everything; from shoes and accessories, to toys, crafting supplies, clothing, linens and more. These drawers are designed to work together in a variety of configurations. This drawer neatly stacks with the 27 Quart Stacking Drawer (item #2310), allowing the shallow and deep drawer sizes to stack in the same footprint. The overall assembled dimensions for this item are 17" x 14 3/8" x 6 7/8". Overall Assembled Size: 17" x 14 3/8" x 6 7/8"
16 Quart Stacking Drawer is rated 4.7 out of 5 by 13. Rated 1 out of 5 by julieh from They Keep Changing their Product I would give sterite a better review but I have been using their storage drawers for over 20 years now. What I find very frustrating is how they change their product constantly so you can never buy the product that you are using and looking for. Last year I purchased some storage drawers and now they have different sizes AGAIN. They dont match up and you cant stack them with any of the older units so I now have over 8 different styles in my storage area that dont work with each other. The ones I purchased last year are 12 inches wide. Now they have changed them to over 14 inches wide. I think they do that so you have to replace all of your old storage bins which would cost me a fortune since I have over 65 units in my office! Very frustrating. Rated 5 out of 5 by PeachGirl from stacking drawers I bought several of these stacking drawers to organize my many sewing projects and items! They are awesome because I can see what is in them before I pull out the drawer! Plus, having a DRAWER is a LOT EASIER than stacked boxes that open at the top...you have to remove 3 or 4 to get to the bottom one!! I plan on buying more Stacking Drawers for my seasonal clothes!!! Rated 5 out of 5 by karatchris from A problem solver I love these drawers! 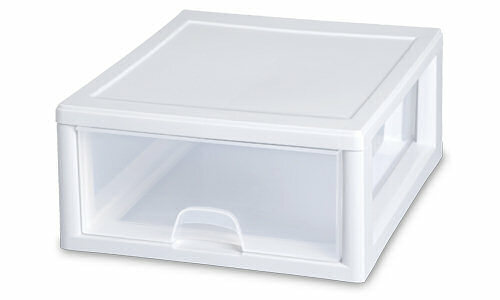 I use these in my kitchen to store my cake baking/ decorating supplies and tools. I was pleased when it fit PERFECTLY underneath my microwave cart. I have 2 stacked on top of one another, and they are housing my cookie cutters and my cake decorating tools. When the apron extension is down, you cannot tell the drawers are there. I couldn't be happier with these drawers! Rated 5 out of 5 by Mary Trinkley from Great for stacking! I have many of these, and I use them in my scrapbooking/craft room. They are very ideal for storing cardstock, pictures waiting to be scrapbooked into photo albums, rolls of ribbon, washi tapes, stamp sets, etc. 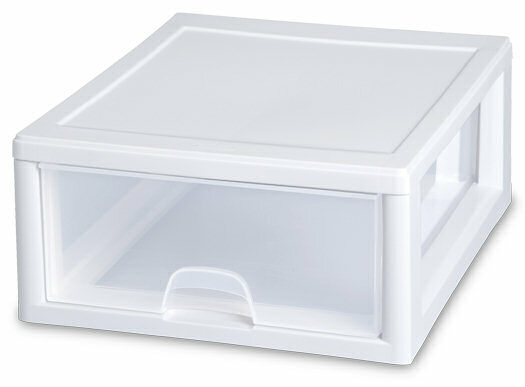 They are very ideal for keeping items separated, protected, and organized. They stack on top of each other, and the drawers pull out very nicely. This is a very sturdy product, and I get more than my money's worth with them. Very ideal for use in a craft room! Rated 5 out of 5 by HollyG from Sterilite Drawers are Great This product is incredibly versatile and so useful. We use them for a multitude of storage needs at our house. They provide easy access to items, yet keep the same items safe from pets (a must in our house). They are durable and a very quality product. Rated 5 out of 5 by oldpueblo from Easy to get organized with these stacking drawers I have several of these in the closet of my office that has an area set aside for crafts. Each one is labeled with the contents and this makes it easy to keep things put away. I use them for craft paint, knitting needles, misc. items and material. Since they look nice besides being practical, they are a favorite with me. Rated 5 out of 5 by TXM0M08 from Great Storage! I have a bathroom that offered almost no storage space, so I bought a few of these drawers in varies sizes. They work wonderfully. Durable, no problems with being exposed to steam on a regular basis (from the shower) and with some cheap plastic dividers, they hold quite a bit. I am very happy with this purchase and plan on using these drawers to organize my daughters craft supplies down the road.